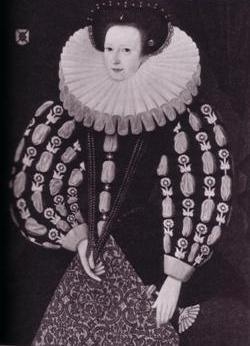 Anne Bracton is the daughter of Sir John Bracton. Lady Anne de Montagu was the daughter of John de Montagu, 3rd Earl of Salisbury and Maud Francis.1 She married, firstly, Sir Richard Hankeford.2 She married, secondly, John de Holand, 1st Duke of Exeter, son of John de Holand, 1st Duke of Exeter and Elizabeth Plantagenet.1 She died on 28 November 1457. [S6] Cokayne, and others, The Complete Peerage, volume V, page 210. Stefan III Herzog von Bayern-Ingolstadt was born circa 1337. He was the son of Stefan II Herzog von Bayern-Ingolstadt and Elizabeth of Sicily.1 He married, firstly, Thaddea Visconti, daughter of Bernabò Visconti, Duca di Milano and Regina Beatrice della Scala, on 13 October 1364.2 He married, secondly, Mynta Elisabeth von der Mark-Kleve, daughter of Adolf III Graf von der Mark Graf von Kleve und Kurfürst von Köln and Margareta von Jülich-Berg, on 17 January 1401 at Cologne, Germany.3 He died on 25 September 1413. From 21 May 1545, her married name became Carey.1 After her marriage, Ann Morgan was styled as Baroness Hunsdon of Hunsdon on 13 January 1558/59. She held the office of Keeper of Somerset House on 14 December 1595.1 Her last will was dated 10 January 1606/7. Blanca de Castilla married Pedro I de Bourgogne, Rei de Portugal, son of Afonso IV de Bourgogne, Rei de Portugal and Beatriz de Castilla, in 1325 at AlfayateG. She died in 1375 at Las HuelgasG. Her marriage to Pedro I de Bourgogne, Rei de Portugal was annulled in 1330. Inez de Toledo died on 4 September 1453. Juana González is the daughter of Pedro González.